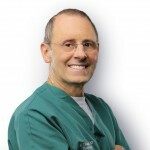 After completing his plastic surgery training in 1989, Dr. Bosshardt became the first plastic surgeon to practice full time in Lake County. What style breast implant should I choose? What implant style should I choose? It seems most patients coming into for a consultation for breast augmentation these days are doing a lot of research online before seeing a plastic surgeon. Among the various decisions that have to be made about implants is what style of implant to choose. Choices in both saline and gel implants include round/smooth, round/textured, tear drop/smooth, and tear drop/textured. Round implants are broken down even further into moderate, moderate Â“plusÂ”, and high profile implants. How is a person to choose among these? Let me explain texturing first. A Â‘texturedÂ’ implant has a surface that looks and feels rough or fuzzy. This surface texturing is intended to encourage the attachment of the tissues around the implant to the surface of the implant. Think of a Velcro-like adherence. The idea behind this is that the surface texturing and tissue adherence will reduce the likelihood that the pocket around the implant might contract, squeezing the implant and making the breast feel hard and/or distorting the shape. This condition is called capsular contracture and is one of the main reasons some women get a less than perfect result. There are several issues with textured implants. One is that they are stiffer than non-textured implants and thus have a significantly higher failure rate over time. Another issue is that the texturing simply doesnÂ’t do what it is intended in many cases (I would say in most cases, in my experience). I rarely remove textured implants where I see significant tissue adherence to the surface of the implant. Textured implants are much more prone to having collections of serum, called seromas, form around them so that in most cases, the use of a drain in each breast is advisable. Drains are, quite frankly, a nuisance for patients, and a potential source of introducing infection into the implant pocket, a disastrous occurrence. When tissue adherence does occur, combined with the added stiffness of the implant, visible and palpable rippling of the implants is more common. Smooth implants do not have the above issues. As to tear drop, also called Â“anatomically shapedÂ” implants versus round implants it would seem that the former would work better. After all, a natural breast is not really round but has a natural tear drop shape, right? True, but it is an interesting fact that when women with round implants have x-rays taken of their breasts while sitting up, the round implants settle into a tear drop shape due to gravity. When they lay down, the implants change to a rounded shape, allowing the breasts to settle more naturally. Because tear drop shaped implants have this shape built into them, they maintain the same shape regardless of position so this natural change does not occur. In addition, they are prone to spinning, flipping, etc. and this can make the breast assume unusual contours. The only way to avoid this is to secure the implant in the pocket in some way, such as by using surface texturing but then, you have the issues with texturing that I mentioned above. It is for these reasons that when plastic surgeons are polled as to their preference in implant style, nearly 85% primarily choose round/smooth implants. They have a lower failure rate, produce great results in most patients, can move around in the pocket without altering breast shape, and just happen to be less expensive than the textured and tear drop shaped implants, as well. I call this a win, win, win, and win situation! As to moderate, moderate plus, and high profile implants, the choice of these relate in large part to the width of the chest and the patients stated goals. Do they want large implants but have a fairly narrow chest? Then high profile implants might work best. Are they an average size, with fairly typical moderately small breasts, and a little loose skin? A moderate plus profile implant will work well. Much of this is very subjective and determined by the patientÂ’s stated goals, the situation they present with, and the surgeonÂ’s aesthetic sense. There are no formulas or computer programs that can precisely predict the best implant size and style for each patient with reliability and consistency. That is part of the Â“artÂ” of breast augmentation.